This week is silly week in Madison’s class, and obviously today was silly hair day. 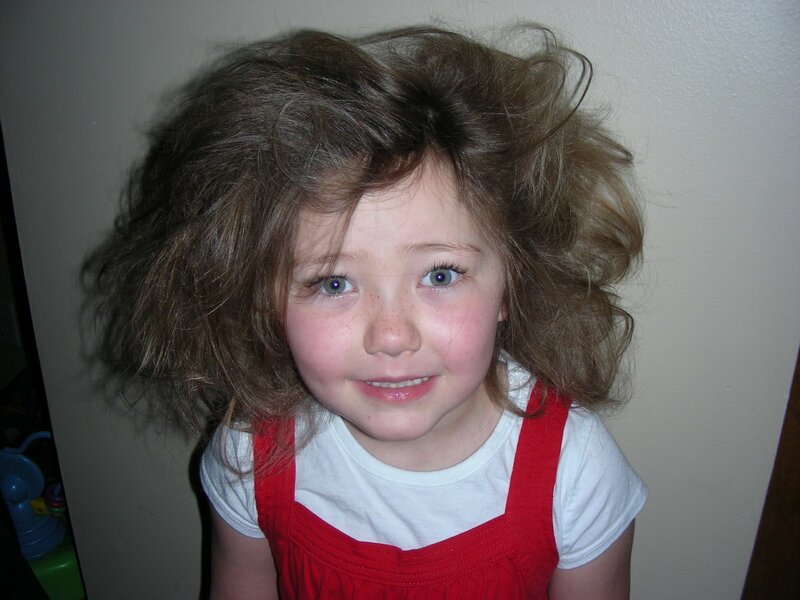 As I was ratting up her hair this morning I told her, “The scarey thing is that people used to do this to their hair for real, not to be silly.” She giggled and said, “I look like a lion.” Madison would have done great in the 80’s! We have had a lot of rain, so most of our games have been cancelled. Here are a few pictures from game #2. We had lots of fun watching the girls. This is Addie…she caught me taking her picture and had to stop and pose. 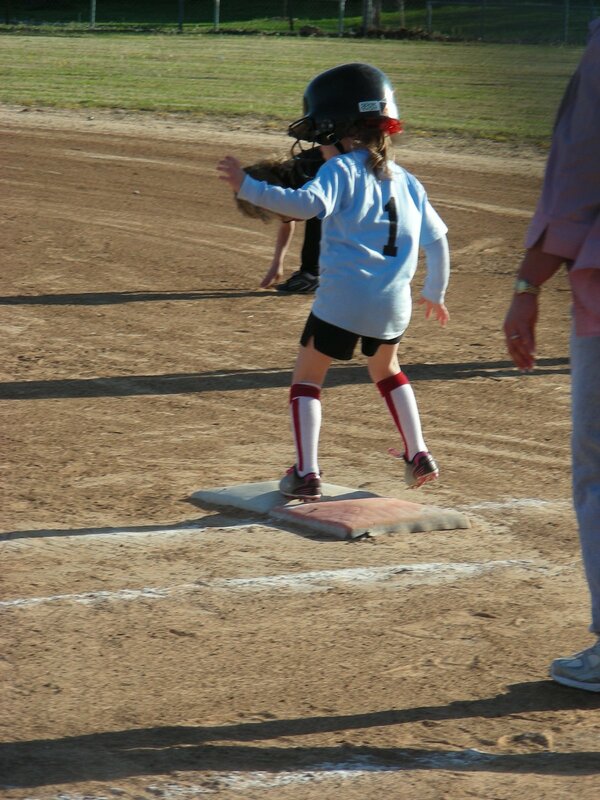 Here is Hope jumping onto first base. Ok, so my computer has been down the last couple of weeks, so I haven’t been keeping up with my blog. Tonight I’m going to try to get caught up. Sorry! The other morning I woke up a little late, so instead of getting to slip into the shower while the kids were still in bed, I had to wait until after Madison was at school, leaving Eli and Lillie alone while I cleaned up. Surprisingly, my shower went uninterrupted, which I really enjoyed, until it occurred to me that this may not be a good thing. Especially since I had heard the stool in the kitchen scooting across the floor. So, I got out of the shower and dried off and headed for the living room to check on Lillie. As soon as I turned the corner, there it was …. Lillie sitting in a pool of goldfish crackers. Eli, who cares very much for his little sister decided that she needed a snack, and took it upon himself to make sure that she was provided for. 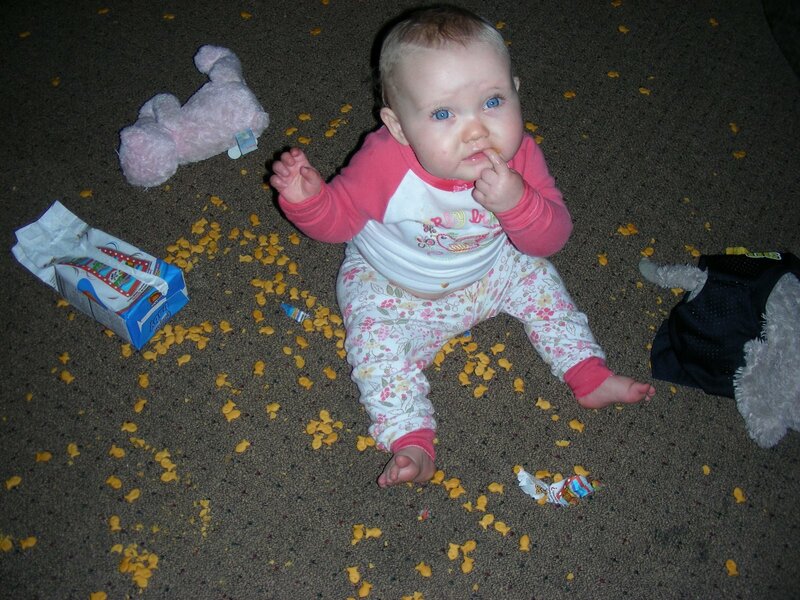 So, he extracted the package of goldfish from the top shelf of the cabinet and lovingly dumped the whole bag on Lillie’s head, shaking any remaining crackers free all over the rest of the living room. Lillie, was grateful for the little treat …. 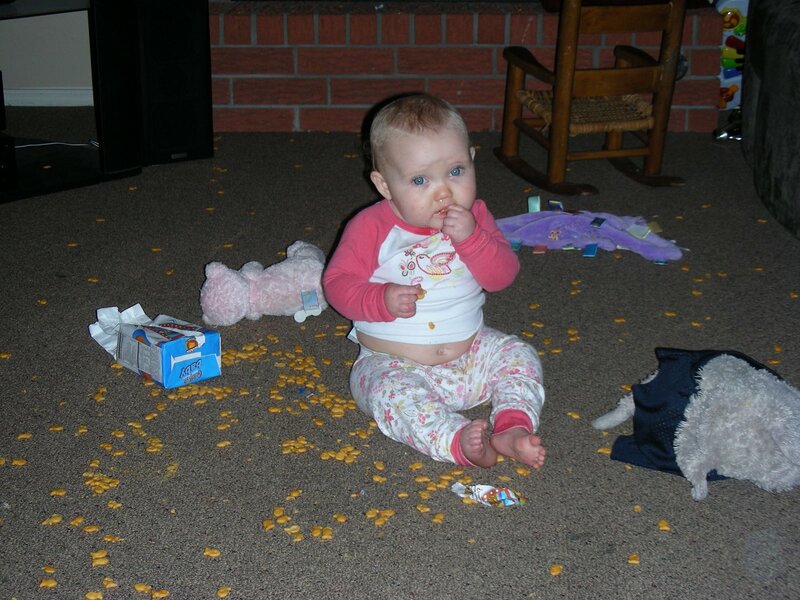 upon seeing me, she quickly began picking up the crackers and eating them. 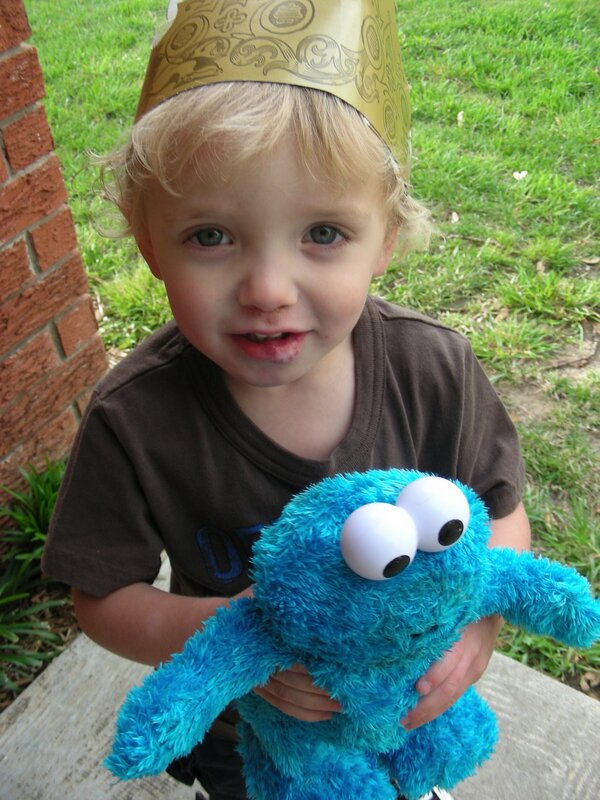 My first reaction was to discipline Eli, but then I realized he was simply babysitting while I was in the shower. 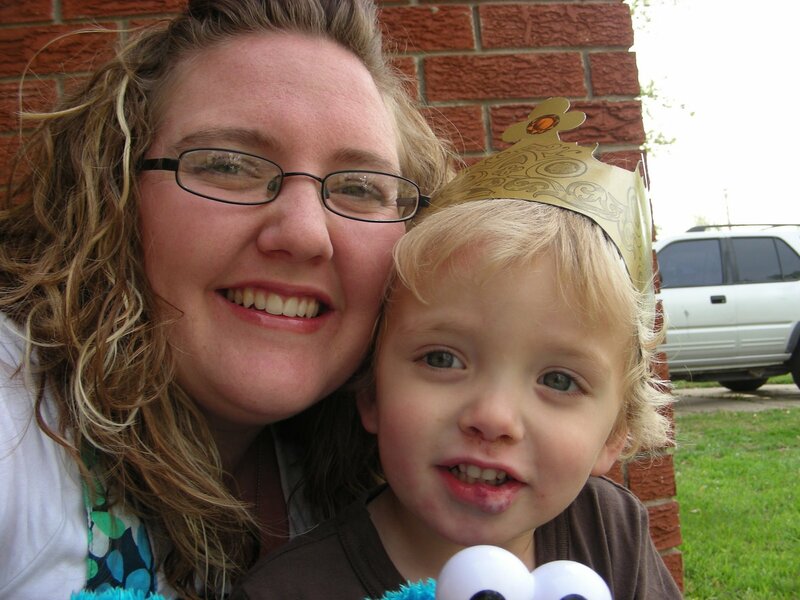 So, I decided to be grateful for the quiet shower and go on, thankful for a son who loves his sister. 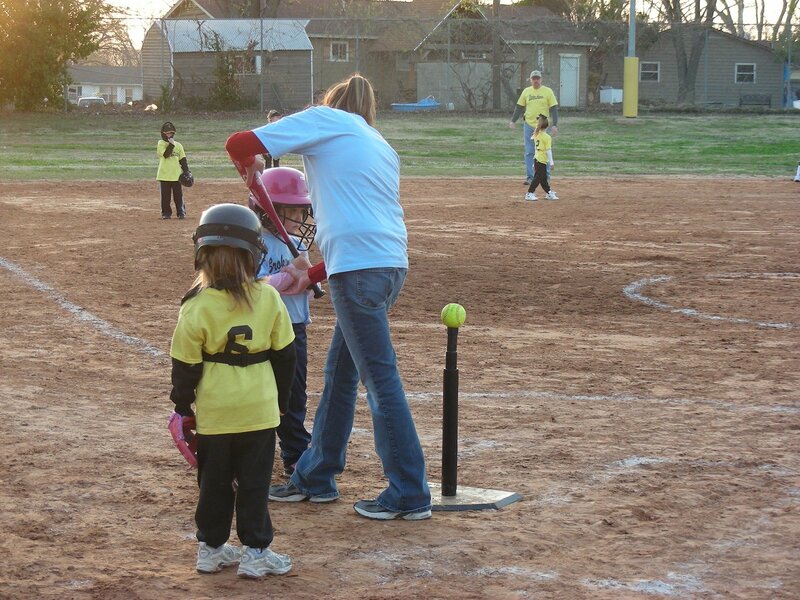 Tuesday was Madison’s first T-ball game. It was freezing cold and wet from rain the night before, but it was tons of fun. Between our family, Hope’s family and Addie’s family, the bleachers were packed. 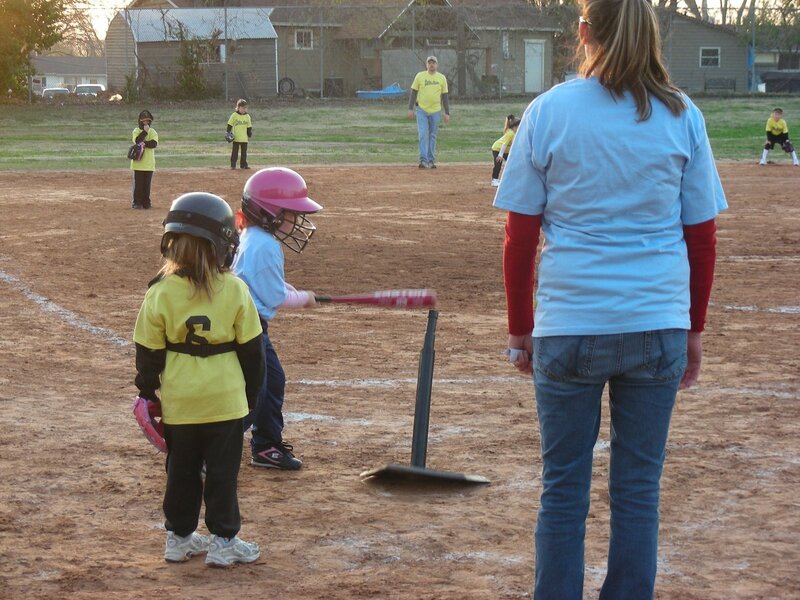 Luckily, Madison was one of the first batters. This is a picture of her with Coach Dani helping her get ready. Madison nailed the ball after a couple of attempts and then headed to first base. But, oops, what’s this? 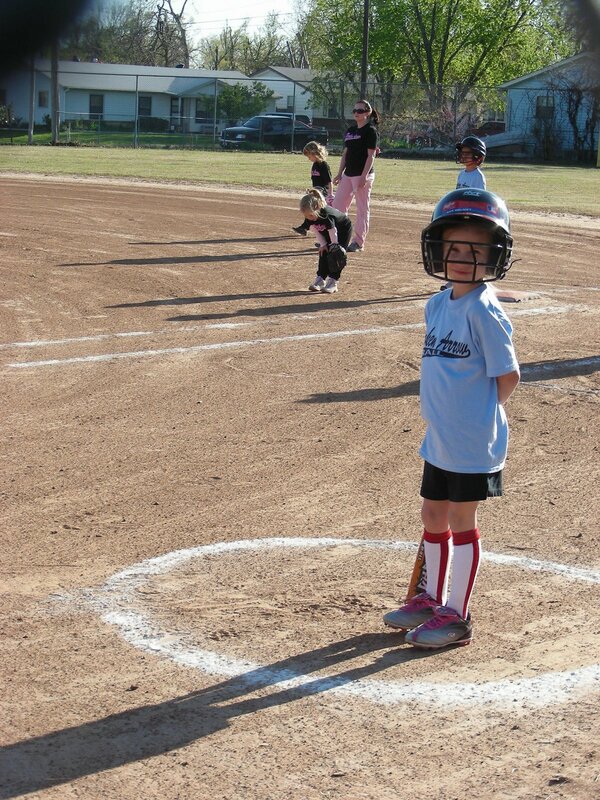 Madison get nervous about getting to first base and starts skipping! 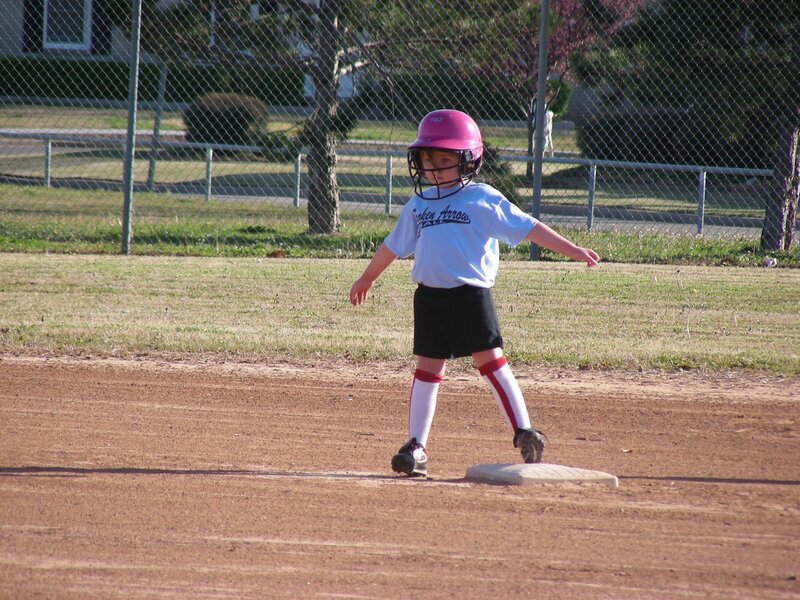 Needless to say, the ball beat her to the base. 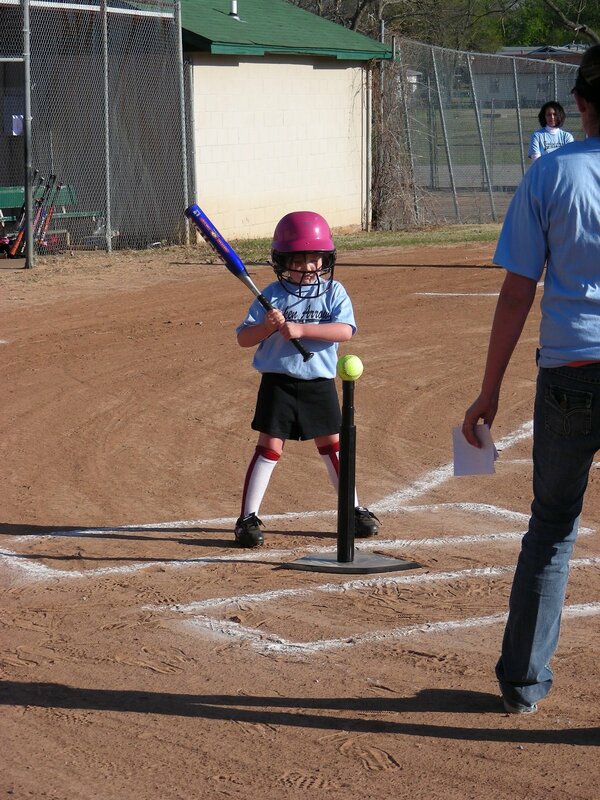 Madison’s next attempt at bat went much better. 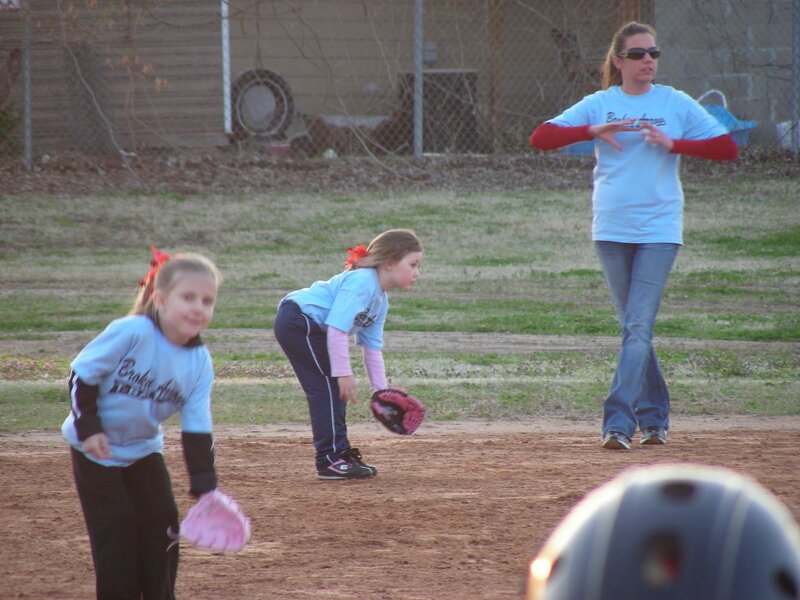 We all cheered as she made it around all four bases…running the whole way! That’s right Madison scored a hit and an RBI all in one game. GO MADISON! !